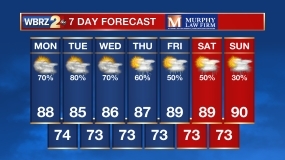 Showers and thunderstorms have all but shut down for the remainder of the week. Forecast focus now shifts to a cold front expected to approach the area this weekend. Today and Tonight: Wednesday will be mostly sunny, warm and humid with high temperatures penetrating the low 90s once again. An isolated shower or thunderstorm can’t be ruled out—especially east of Baton Rouge and near coastlines. Mostly clear and quiet conditions are in store for tonight with low temperatures holding in the mid 70s. The break from unsettled weather will be welcome for most. 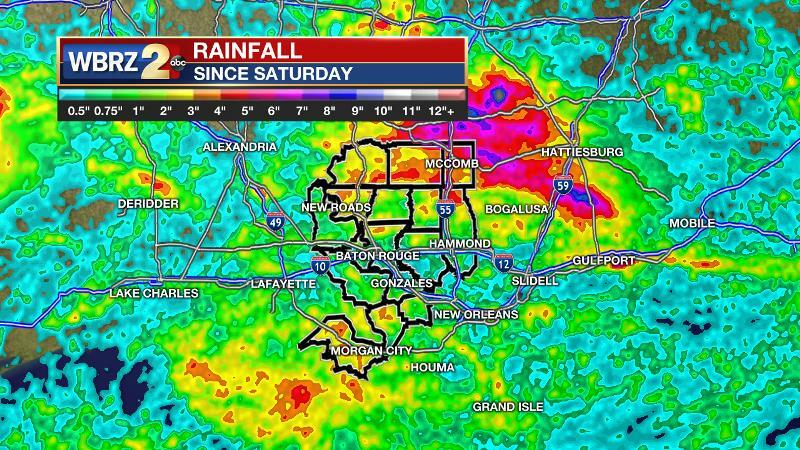 Locations in Southwest Mississippi have picked up 4-6 inches of rain since Saturday. Some coastal areas received 3-5 inches while the Capital City only measured an inch or two. Up Next: The end of the week will be dry and hot. Any pop-up showers will be very isolated. Afternoon temperatures will make it into the mid 90s and stay there for several hours producing a longer duration of feels like temperatures over 100. Lows will be in the mid 70s. On Saturday, a cold front will come into the region. A round of strong to severe thunderstorms will be possible as it arrives. The front will creep through the area with some lingering showers, perhaps into Sunday morning. Beyond the front, expect at least two quiet days. Temperatures will drop just 2-4 degrees below average, which isn’t really noticeable during the hot Gulf Coast summer months. On the other hand, pulling dew point temperatures down a few degrees and therefore reducing humidity, will be a change we can feel. Any relief will not last far beyond Tuesday. The Tropics: Nothing significant is ongoing in the Atlantic Ocean or Gulf of Mexico. No tropical development is expected over the next 5 days. An area of high pressure will build into the mid levels Wednesday through Friday. The stability and subsidence resulting from this ridge will lead to far fewer showers and thunderstorms and additional warming during the afternoons. High temperatures will rebound to slightly above average with some locations peaking in the mid 90s. Low temperatures will go unchanged, bottoming out in the mid 70s. Moving into the weekend, a fairly significant 500mb trough will be digging out of the Great Lakes region into the Southeast. With this trough will be an accompanying cold front at the surface. Present forecast model indications are that this front will indeed make it into the local area, perhaps clearing into the Gulf of Mexico by early next week. Previously noted timing issues between the GFS and ECMWF are beginning to ease. It looks as though the main impacts front this front will be felt on Saturday. With regard to showers and thunderstorms—ample heat and humidity interacting with frontal lift should be more than enough to enhance development. More so, we will need to monitor the possibility of some strong to severe storms with gusty wind. 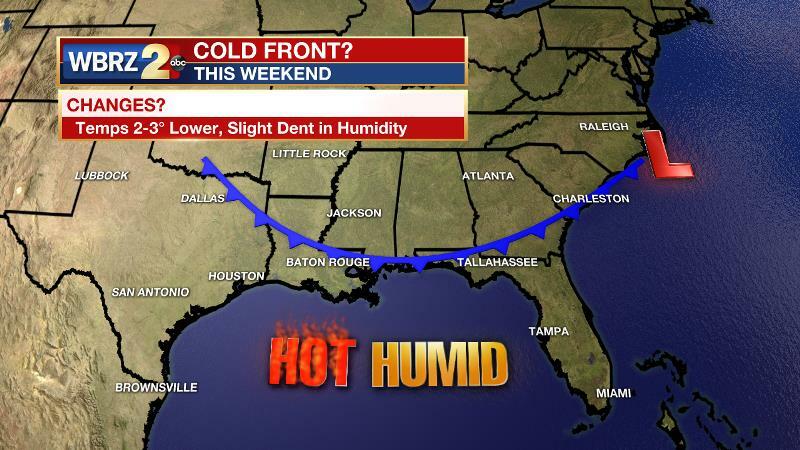 Cold fronts don’t often have the chance to tap our energetic summer air mass. As far as temperatures go, the upper air mass does look fairly anomalous for the time of year. Modest drying will occur and some of this will translate to the surface. At this time, forecast models are showcasing dew points down by about 3-5 degrees into the upper 60s and high and low temperatures down 3-5 degrees, near 90 and 70 respectively. This is not a major departure from average but may provide a noticeable change—especially with respect to the humidity. Return flow will kick back in on Tuesday.